Swiss meringue buttercream is a light and delicious frosting that creates a smooth finish and pipes easily. It works well on cakes of all sorts, including cupcakes and wedding cakes. Swiss meringue is a cooked meringue, so you can safely use fresh egg whites; however, meringue powder or pasteurized powdered egg whites are a convenient alternative and remove any risk of Salmonella. Prepare a double boiler or bain marie by placing a stainless steel or heat-safe glass bowl over a saucepan with simmering water. The water should not touch the bowl. Whisk together meringue powder and water to make enough Swiss meringue to frost a typical layer cake. Add granulated white sugar to the meringue mix. Cook over indirect heat until the mixture is smooth and the sugar has dissolved completely or until the mixture reaches 160 degrees Fahrenheit. Pour the mixture into the bowl of a stand mixer. 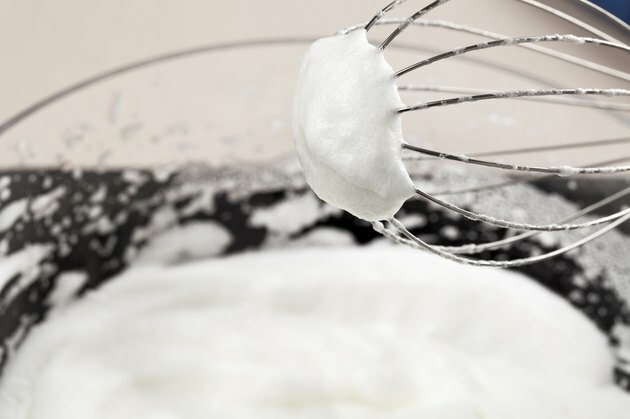 Whip on high speed until the meringue becomes thick and white, with soft, glossy peaks. Add vanilla to the mixture and beat until just combined. Chop four sticks of unsalted butter into small pieces. Add butter to the egg whites, little by little, while the mixer is running. Continue to mix on high speed for several minutes until the butter and meringue form a thick, creamy frosting. Swiss meringue often breaks or curdles into an unappealing mess during the mixing process. Continue beating and it will become smooth.